Technology is changing how we interact with each other in just about every context. As technology consumers, providers, and users, we experience this first hand every day. We’ve seen technology transform almost every aspect of our lives, from how we shop to how we keep in touch to how we order takeout. And it’s not just individuals who are more connected than ever. Customers now have more channels for communicating with businesses and requesting support. Of course, this is largely reflected in the rising expectations for customer service and support teams. Furthermore, devices, products, and services are also becoming increasingly interconnected. The new customer experience involves a range of devices and services that rely on each other to properly function. As a result, customer environments are transforming to the point that it no longer makes sense for businesses to act independently when providing support and customer service. While these changes introduce new challenges for support teams, they also provide new opportunities. Just as consumers are more increasingly interconnected, businesses, service providers, and support teams have the ability to connect and collaborate with each other, too. This is where the ecosystem economy begins to take shape. What is a Business Ecosystem, Exactly? A business ecosystem refers to a network of interconnected teams and providers who work collaboratively to create seamless customer experiences. This community or ecosystem shares knowledge and context about the customers they serve together. Business ecosystems are made possible by collaborative support technology, like shared knowledge bases and cross-team communication platforms. By pooling their shared knowledge and customer intelligence, participants in a business ecosystem can visualize the bigger picture, solve larger problems, and optimize the entire customer journey from start to finish. The modern customer has a multitude of options at their fingertips and the power to switch between service providers as they please. This means there’s more pressure than ever to exceed customer expectations in terms of the level of service and support your team provides. It’s also harder than ever for individual brands and businesses to stand out and get noticed for their excellent service. 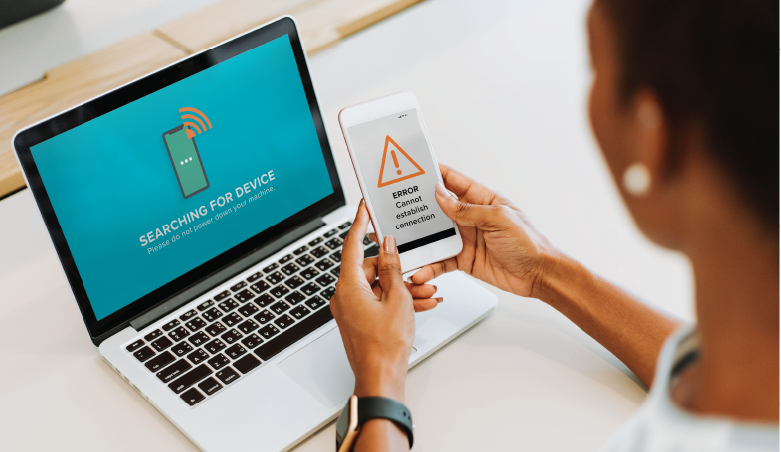 Since different devices and technology rely on each other to work properly, customers expect the whole ecosystem to operate smoothly as a single entity. Furthermore, from the customer’s perspective, a service failure at any point of the technology chain is a failure that reflects poorly on your team. Sam is a business owner who’s excited to start using a new cloud-based CRM. Everything seems to be going well, until she tries to sync her data to her phone – and nothing happens. So, what next? Who should she contact to fix the issue? Well, the correct answer would depend on where the problem stems from. Unfortunately, it’s often difficult or impossible for a customer to accurately diagnose the cause on their own. Sam decides to call the CRM provider to ask about the syncing issue. When no one answers the phone, she sends an email instead. While she’s waiting for a response, Sam calls her internet service provider to see if they can tell her why the devices won’t sync. She speaks to an agent who confirms that her internet connect is up and running, and there haven’t been any recent service interruptions. Sam considers that it could be a hardware issue. She contacts the store where she purchased her phone and laptop, but the clerk suggests reaching out to the companies who made her devices. By the time she hears back from the CRM company (who, by the way, think it’s a device compatibility issue, but needs more information from her to confirm), Sam is already on the phone with the guy who installed her new router last week. Without shared knowledge and context between service providers, what should be a simple fix can quickly turn into a nightmare for the customer. However, if these service providers collaborated by sharing information about the customer and their devices, Sam would receive reliable support regardless of which business she reached out to. 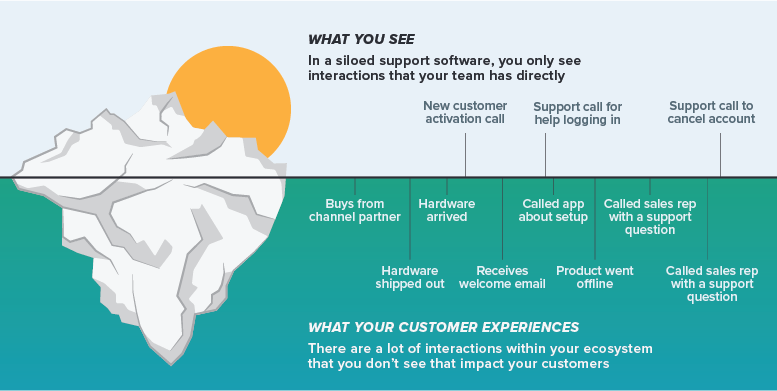 Before the emergence of business ecosystems, customer support teams could act independently. Customer service was conceptualized as a one-to-one interaction: a customer contacts a business to request and receive support. Businesses only focused on (or even knew about) interactions that occurred directly between their team members and their customer. If another service provider along the technology chain was struggling to deliver great support, it wasn’t your concern. Today, hanging on to that narrow understanding of the customer journey is dangerous. It limits your ability to recognize and cater to customer needs. The ecosystem economy makes it possible and necessary to understand the entire customer experience from start to finish – a valuable perspective that isn’t available when service providers operate in silos. Under the new rules of the ecosystem economy, businesses must collaborate and support each other. Participating in a business ecosystem not only improves the customer experience, but also empowers support agents and bolsters the brand’s reputation. In the ecosystem economy, there’s strength in numbers. By collaborating with other service providers and support teams, you can elevate customer experiences beyond anything one team could deliver alone. The shift to an ecosystem economy is already underway. Your customers are already engaging with a range of teams and service providers – so why isn’t your support team doing the same?